The Hanoi Imperial Hotel is perfectly located for both business and leisure guests to Hanoi. This 3. 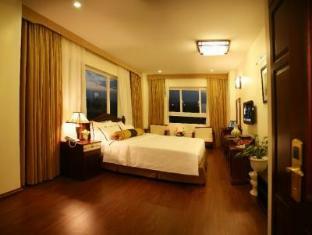 5-star hotel was established in 2009 and offers 50 guestrooms. All of the guestrooms are replete with separate shower and tub, jacuzzi bathtub, non smoking rooms, air conditioning, bathrobes, daily newspaper, desk, hair dryer. Guests can experience the high standards of comfort while staying at this luxury Hanoi hotel with everything they need right on the site such as 24hr room service, shops, executive floor, elevator, coffee shop, bar/pub, laundry service/dry cleaning. Modern comfort and convenience are seamlessly combined to ensure the guests' satisfaction. This hotel is characterized by a combination of modern comfort and traditional element of Hanoi, making it a distinct accommodation. To proceed with this reservation at the Hanoi Imperial Hotel, please enter your visit dates and follow our secure online reservation form.